Safety cautions should be complied with for preventing accidents or damage to properties. Possible malfunctions may cause fire or electric shock. Do not let metallic material or liquid in the product. This may cause failure or fire on the product or electric shock. Do not use the product if it is broken. damage to the system, fire, and electric shock. Avoid directly facing a beam lit from the optical-out for preventing damage to vision. 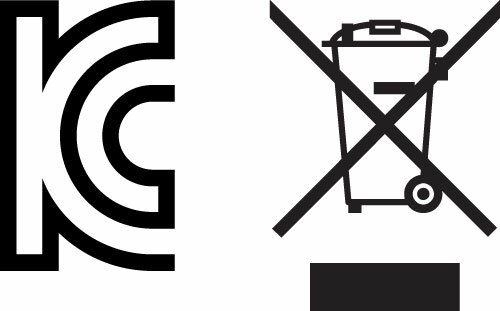 Do not forcibly fold or pull the connection cable and other cables. Slide up the output volume bit by bit from min to max for appropriate volume control. Excessively high volume may cause negative influence on your auditory functions. ■ It can be used PCIe slot of motherboard, highly compatible C-Media chipset is adopted. ■ Analog 5.1 channel output, microphone and line-in terminal jack are adopted, it is faithful to multimedia features. ■ The MAYA 5.1 PCIe has stereo mix function so it supports the internet broadcast, music broadcasting and YouTube etc. ■ Microphone amplifier function is adopted, when using microphone that has a low sensitivity, it can amplify an incoming signal. System requirement is crucial to take full advantage of high quality sound and multimedia features provided by MAYA 5.1 PCIe. MAYA 5.1 PCIe is basically designed to use minimum computer source, but you are strongly encouraged to meet recommended system requirement for maximum performance. ※ Audiotrak's public website provides driver and user's guide. Please visit our website. ① MIC-IN : Connecting with a microphone. ② LINE-IN : Connecting with the external audio devices. ③ FRONT-OUT : Connecting with a speaker with 2 channel and 2.1 channel / headphones / earphones etc. or a front of 5.1 channel speakers. ④ REAR-OUT : Connecting with a rear of 5.1 channel speakers. ⑤ CENTER-OUT : Connecting with a center/woofer of 5.1 channel speakers. ※ The color is subject to change without notice. 1) The PCIe card is wrapped with static electricity prevention plastic. You had better not unwrap the PCIe card before installing it on your computer for preventing any damage. 3) Remove the computer case from the computer. Check one vacant PCIe slot located on the motherboard of your computer for installation of the PCIe card. 5) Hold the PCIe card by an edge and a guide part which is a place for securing the PCIe card to the computer case with screw. You had better not touch the parts inside the edge of the PCIe card. 1) Remove the computer case from the computer. 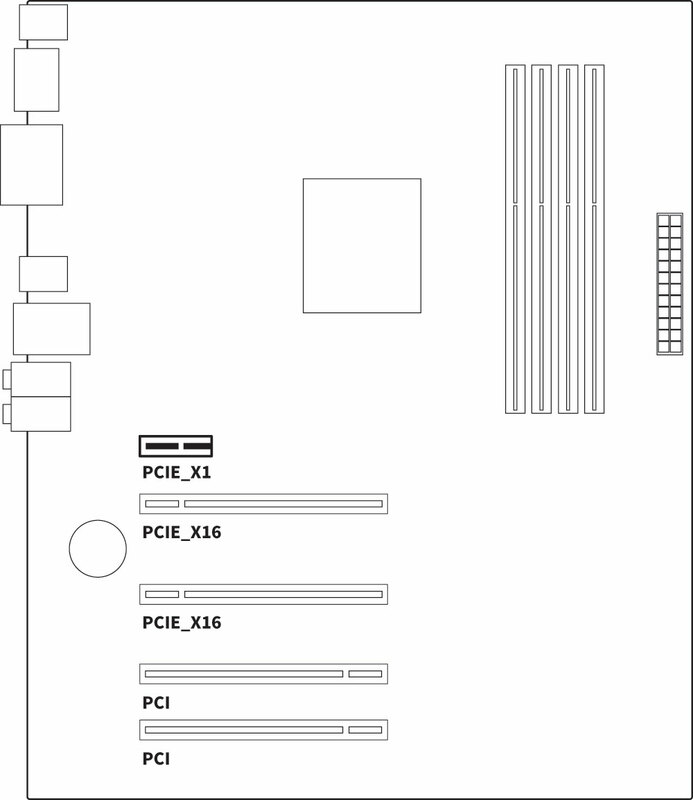 Acco㎜odate the sound card to a vacant PCI Express 1x (PCIe 1x) slot. 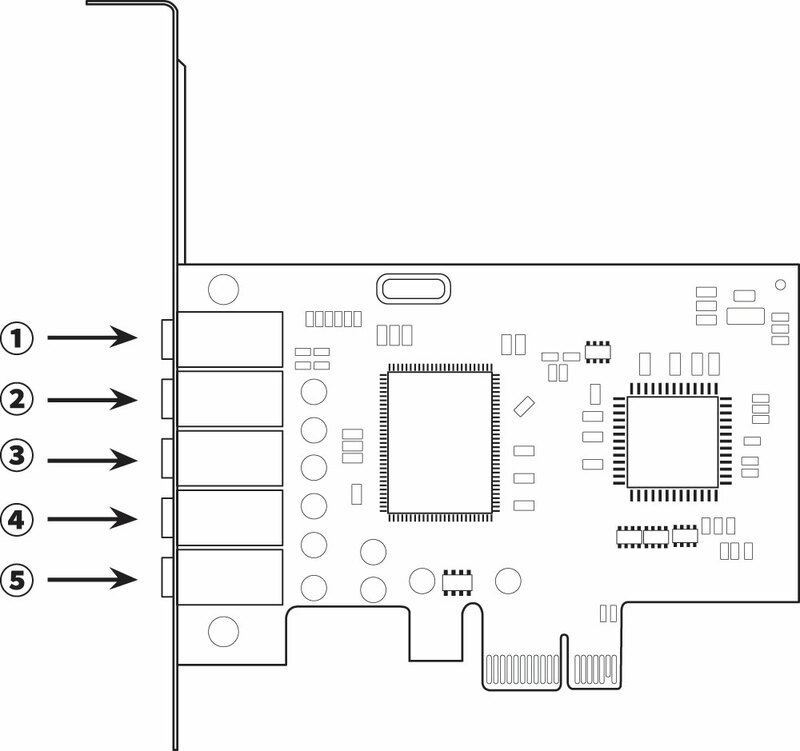 The latest motherboard usually has three types of slots which are the longest PCI Express 16x slot for graphic card, the shortest PCI Express 1x slot, and the PCIe slot for the PCI sound card. The PCIe slot has the same length with the PCI sound card so that users can easily locate the PCIe slot. 2) Locate a PCIe slot. Remove the empty guide from the computer case. The guide is usually inserted in a vacant slot. When installing an extension multimedia card, users are strongly encouraged to acco㎜odate the sound card to a slot which is positioned one or more slot away from the graphic card. ※ Caution : If the sound card is wrongly acco㎜odated to the PCIe slot, then the power is on,system including the sound card may cause severe damage. 4) After completing the installation of the sound card, place the computer case back on the computer, reconnect the power cable, and install the speaker. ※Caution : Users should use AMP-embedded speaker using power cable. ① After completing sound card installation, restart your computer. If you are prompted for new driver found, click Setup.exe file. You can download on Audiotrak's public website. ② After completing the installation, restart your computer if prompted. 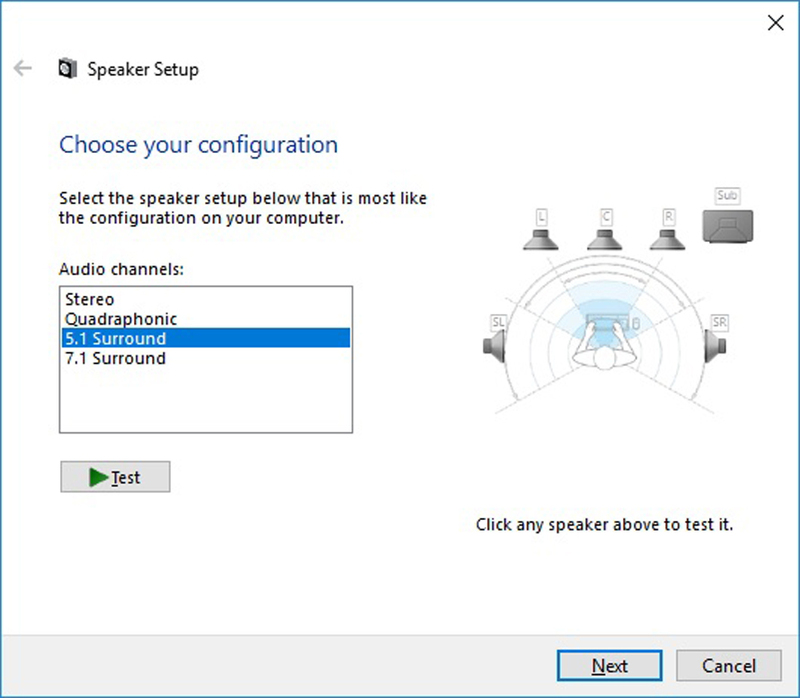 ③ Right click the speaker icon on the taskbar and click the playback device, you can use sound setting. You can use the volume control, analog output channel setting and recording settings etc. in the sound setting to appear from the window screen. 1. 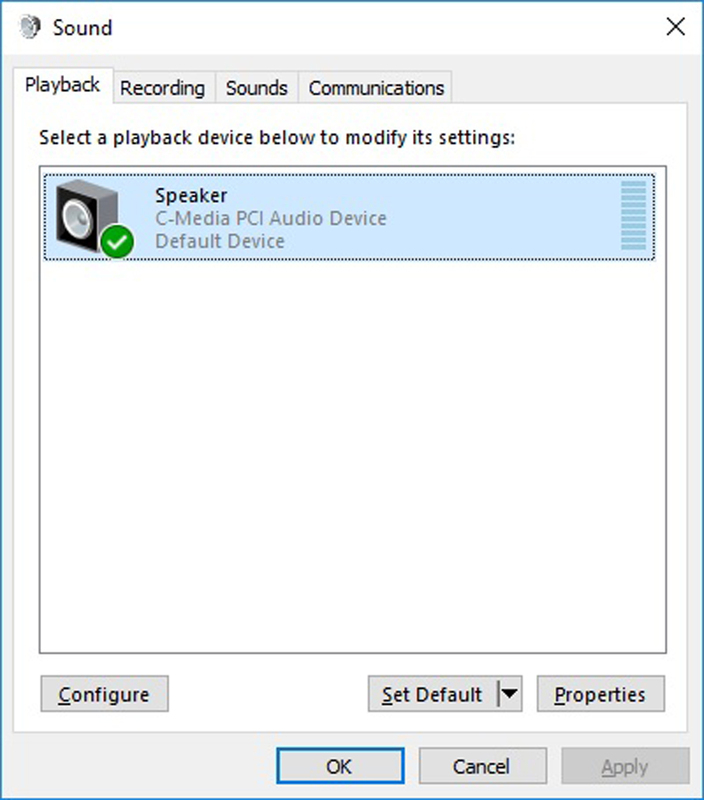 Set the speaker "C-Media PCI Audio Device" as Default Device. 2. 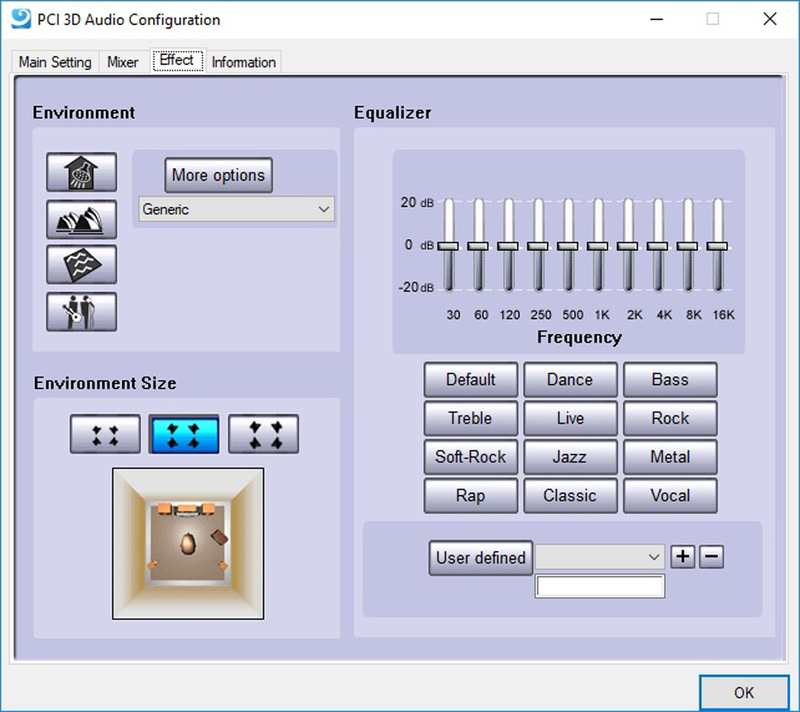 Choose the speaker "C-Media PCI Audio Device" in Speaker Setup, you can select the speaker setup. 3. 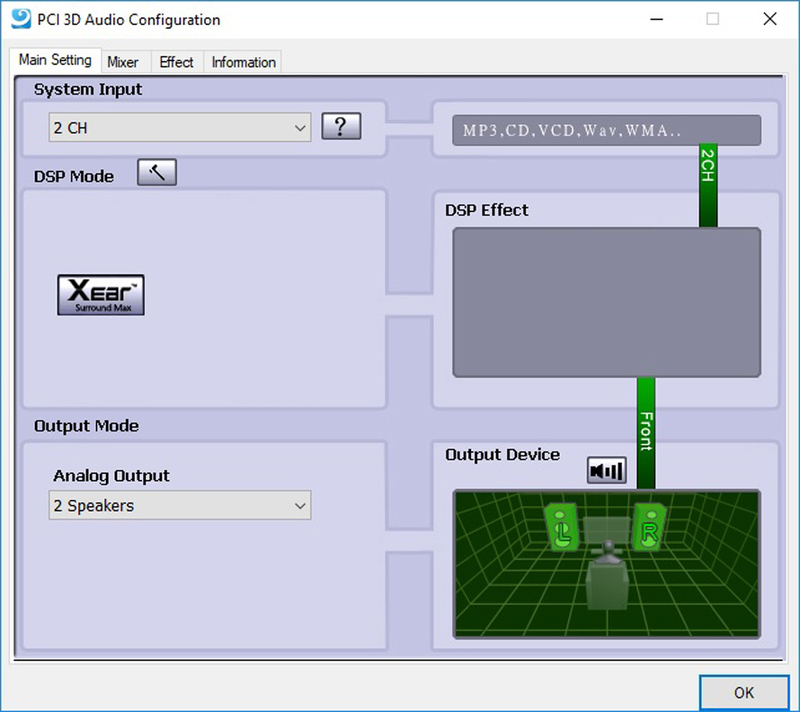 Choose the speaker "C-Media PCI Audio Device" in Speakers Properties, and then an incoming signal output to speaker using volume control, microphones and line-in in Levels tab. ※ If using 'Stereo Mix" recording function, uncheck the mute in Levels tab and then turn up the volume properly. 4. After choosing the recording device to use in Recording tab, set as Default Device. ※ To use a microphone recording, choose microphone in Recording tab and then set as Default Device. 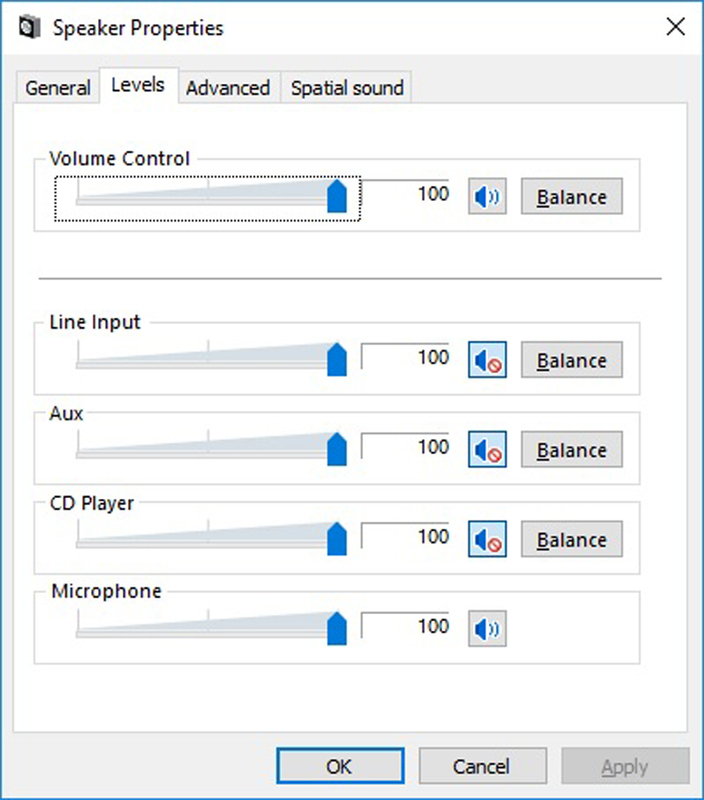 ※ To use 'Stereo Mix' recording function, set as Default Device, Stereo Mix -> Right click -> Enable. 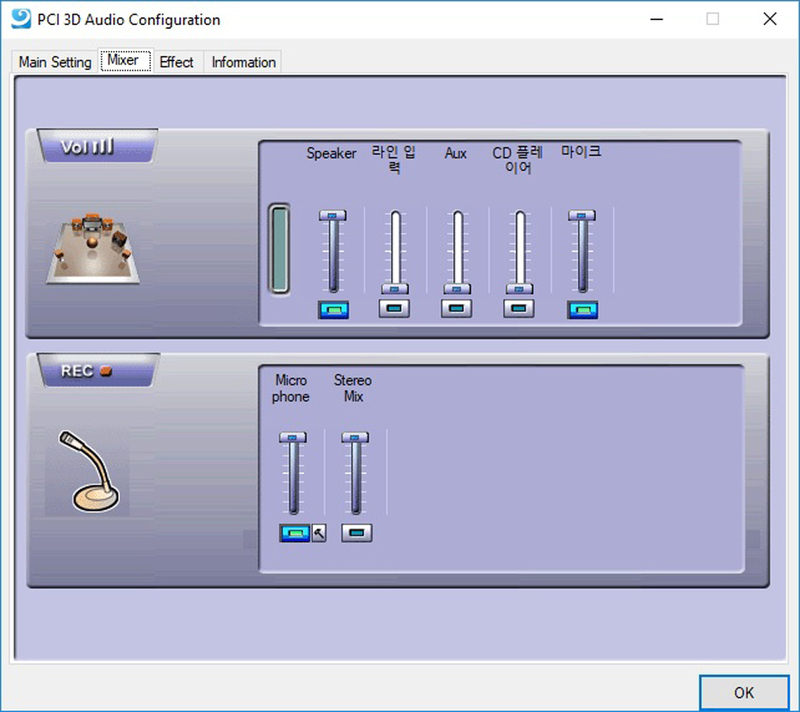 After restarting your computer, the PCI 3D Audio Configuration icon is created on the taskbar. 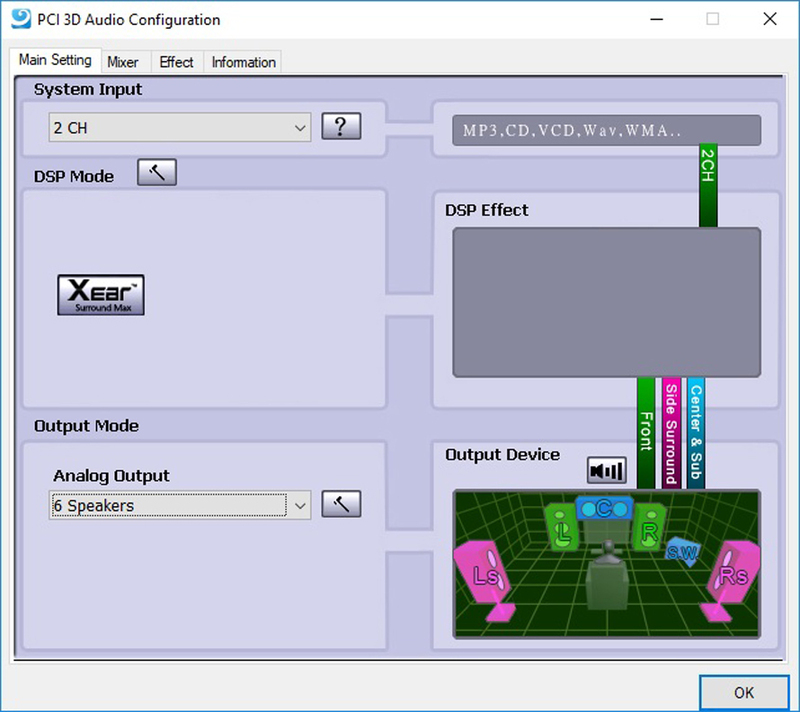 Click the PCI 3D Audio Configuration icon on the taskbar, and then control panel appars on the screen. ■ Sets speaker output channel and speaker test in the Main Setting. ■ When using 5.1 channel speaker, please set to 6 channel. ■ Sets volume control and recording setting in the Mixer tab. 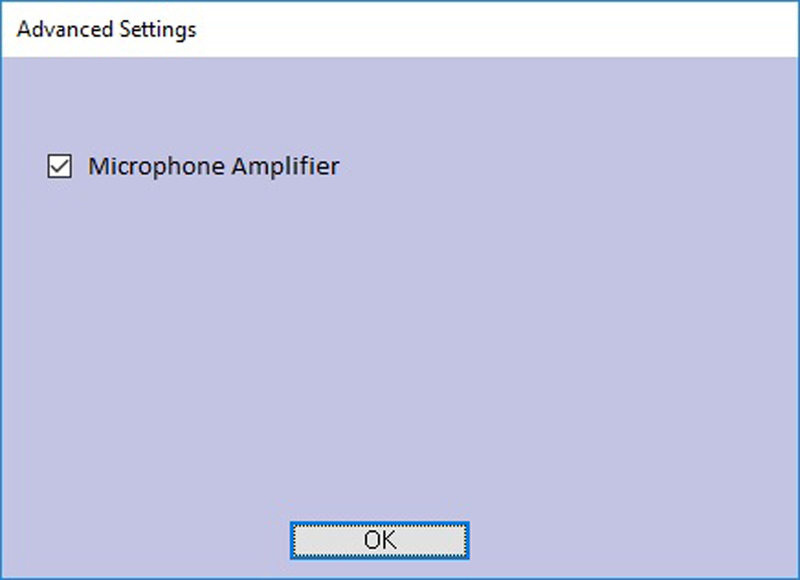 ■ If you click the hammer icon, you can use microphone amplifier function in the Advanced Settings. ■ Sets Environment effect and Equalizer in the Effect tab. ■ The Information tab displays the Audio CODEC and DirectX Version etc. 1) Turn on your computer, and then keep pressing [DEL] to enter UEFI Setup(CMOS Setup). Method for entering the UEFI Setup(CMOS Setup) may differ depending on the motherboard, mostly by pressing [DEL], but rarely by pressing F1, F2, or F10. 2) Select Sound Setting mostly from Onboard Device Configuration or Integrated Peripherals, but rarely from Advanced Setting or Chipset Setting. If your motherboard has different CMOS setting details from details described above, please consult with manufacturer of your motherboard. Because the CMOS setting details are slightly different depending on the motherboard. Unless motherboard chipset driver, window update, and service pack are properly installed, error or continuous noise may occur during driver installation of the PCIe sound card. Therefore, if the operating system is newly installed, window update and service pack as well as motherboard chipset patch driver included in the installation CD bundled with motherboard should be applied prior to installation of the sound card. If you think you don`t know well enough about your motherboard chipset, please consult with manufacturer of your motherboard. 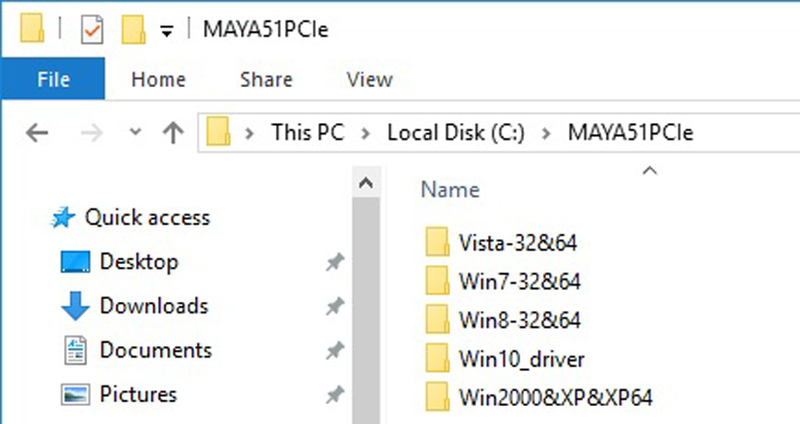 FAQ / TIP provides tips for solving problems you may encounter during the use of MAYA 5.1 PCIe. The driver is required to be updated, remove the previously installed driver, restart the system, and reinstall the driver. 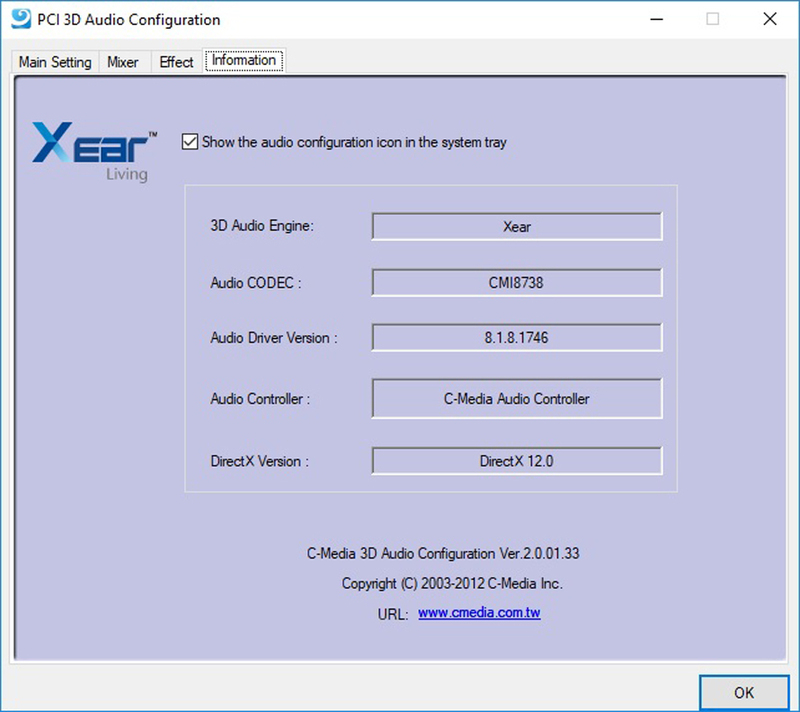 For removing the driver, remove C-Media Audio Device in the Control Panel → Program Add/Remove. 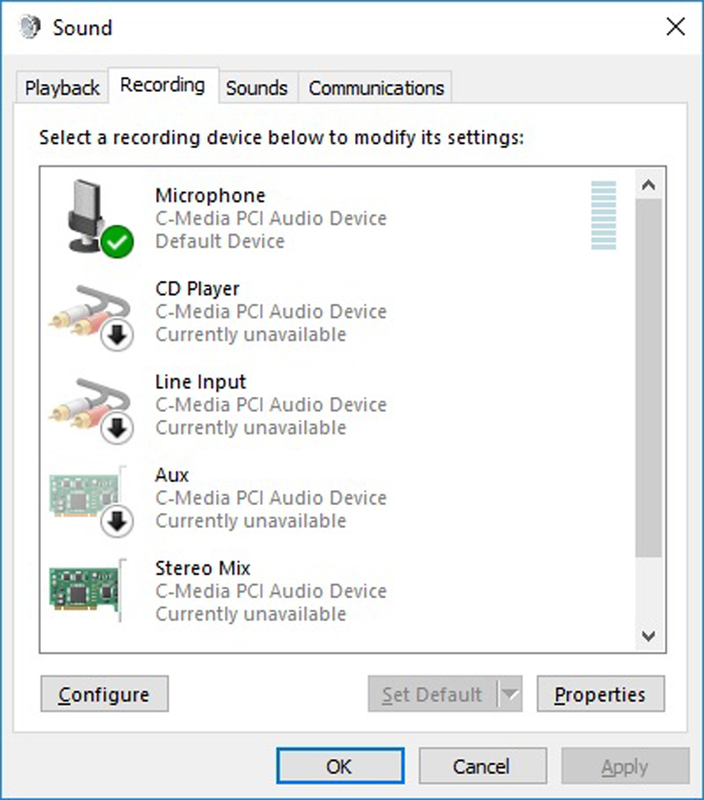 On Windows 10, please remove C-Media Audio Device in the Apps & features. Q: Do I have to mount a card into the PCI Express 1x slot...? No, it's compatible with PCI Express 16x slot, PCI Express 8x slot and PCI Express 4x slot. Your computer do not recognize the PCIe card which doesn’t fit snugly, so that errors may occur. Separate the PCIe card from the PCIe 1x slot and then firmly press the PCIe card into the PCIe 1x slot again. If the PCIe 1x slot is defective, try to install the PCIe card on another PCIe 1x slot. Gold-striped tabs of old PCIe card which are directly contacted to the PCIe 1x slot may be corroded by dust or water that are invaded inside the computer, so please scrub the gold-striped tabs clearly with eraser or lubricant. The driver may conflict with other hardware devices so that the computer gets down during driver installation. Check if there is an on-board sound device on the motherboard, if so, deactivate the embedded sound device. After that, if you still experience the problem, try to install the sound card on another slot. If the computer is still abnormal, remove the existing PCI devices to perform inspection and consult with service center QnA.